Links to communities via websites, groups & blogs, for discussion on Cinematography. The 11 Second Club is a monthly character animation competition open to everyone! LoopdeLoop is an animation challenge. Each month, animators from around the world create looping animations based on a given topic and upload them to the site. Forum for discussing visual effects and making special effects. 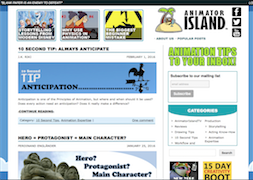 If you know of any other great animation websites, blogs, or groups, please email us and we will add them to the site. The Animation World Network is a place for questions, commentary and debate on any and all aspects of animation. Animation Forum.net encourages all of its members to display their artwork, discuss techniques, critique each others work and more. CGTalk, the CGSociety's official forum for digital artists. Animation Insider’s goal is to focus on the blue collared worker of animation; the back bone of the industry. We want to focus on the people in the trenches who make the award winning stuff we love. A forum for animators who use Anime Studio on Lost Marble.com.